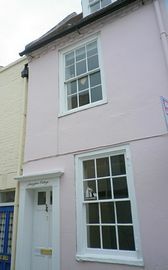 A bijou grade II listed eighteenth century cottage in the heart of the famous Deal Conservation Area. It has been sympathetically modernised and is ideal for a relaxing getaway, or those who need a base for golf, cycling, walking or seeing the many sights of Kent. It has a modern kitchen with dishwasher, featuring a breakfast bar with two stools.There is also a microwave, freezer and washing machine. The cottage has a double bedroom and a further bedroom with two twin beds. 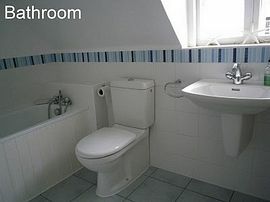 The bathroom is also recently modernised. 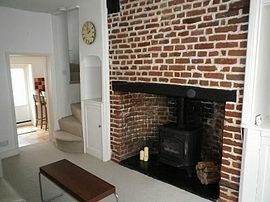 The living room has a large feature fireplace with bressumer beam and stripped bricks, with a lovely gas fire that looks like a wood burner, but without the mess! 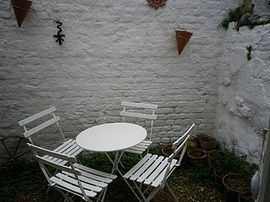 There is a small table for dining/cards etc. Sorry, but Smugglers Cottage is not suitable for children under (approx) 8, or those with limited mobility, due to its historic, narrow, winding staircases. A few metres from seafront. Luxurious Pima cotton 400 thread bedlinen and Egyptian towels provided. 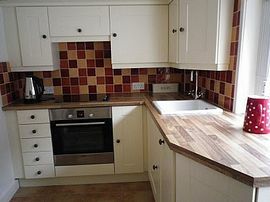 Local Services: Seafront is a few yards away, ideal for nearby golf courses, high street is less than 10 mins walk. Easily accessible by car from M2/A2 or M20. Deal has its own rail station for links from/to London. The high speed link also now runs from St Pancras/Stratford to Dover in just over an hour, with various options available for the short onward journey to Deal. From £295 - £495 per week, do see website or contact owner for details.